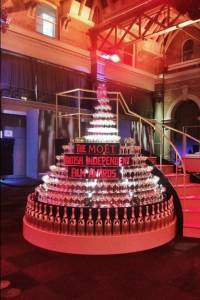 Irish stars Brendan Gleeson, Andrew Scott, Imelda Staunton and Stephen Rennicks were all honoured with prestigious accolades at Sunday night’s Moet British Independent Film Awards. 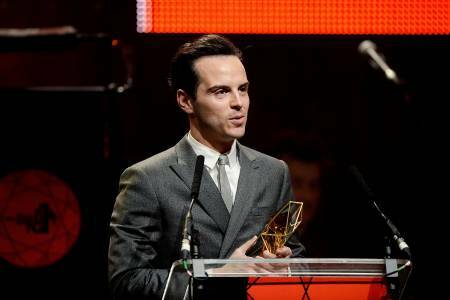 Dubliners Gleeson and Scott claimed the two male acting prizes, as London Irish actress Staunton won for her role in Pride and composer Rennicks took the gong for best technical achievement in recognition of his work on the Frank soundtrack. The star-studded event was hosted by the Inbetweeners’ Simon Bird as Helen Mirren, Keira Knightley, Benedict Cumberbatch and Emma Thompson, who won the honorary Richard Harris Award, all shone on the red carpet. Gleeson saw off competition from Oscar contenders Cumberbatch and Timothy Spall for his role as Father James Lavelle in Cavalry where he reprised his The Guard collaboration with John Michael McDonagh. Speaking to the Irish World after accepting his prize, Gleeson praised those taking risks in independent film to allow artistic projects to flourish in the film industry. “I think the heart of cinema is in independent film, it encapsulates artistic intent in a way that the studios don’t. “It’s a mistake to just think that independent film is a maybe one of those little roads that leads onto motorways for people with ambition to get somewhere else. “It’s up to us to bring the people in. Studio movies do well with what they do with the glitz because people love to escape and be entertained. But we have to entertain too, not just give a lecture! 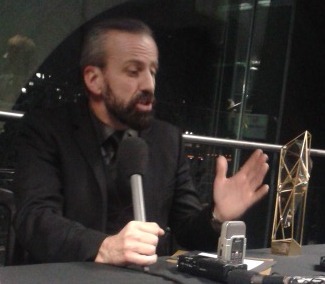 Scott and Staunton won supporting awards for their roles in Pride, a film about the unlikely coalition between gay campaigners and strikers during the 1984 UK miners dispute which also won best film. Staunton was not present on the night, but Scott was delighted with his win and the media hysteria surrounding his busy week in which it was confirmed he will take a role in Sam Mendes’ upcoming Bond film, Spectre. Austrian star Christopher Waltz is assumed to be playing Blofeld, one of the biggest Bond baddies ever, but could Scott, who impressed in his villainess Moriarty role in Sherlock, steal the part? “I’ve read the script so it’s completely speculative! It’s great because I’ve got good at keeping secrets, you learn to nod and smile, it’s part of the fun. Rennicks had the difficult task in writing the score for Frank, a comedy drama in which inspiring musician, Domhnall Gleeson, joins a pop group led by enigmatic figure Michael Fassbender who wears a giant head like comic persona Frank Sidebottom. Maggie Gyllenhaal and drummer Carla Azur make up the rest of the band and Rennicks recalled the difficulties in orchestrating a sound that the audience believed was produced by the fictional band. “It was fun, but I also experienced literal terror. It was a real nuts and bolts technical thing. “The band was made up of three actors and one musician, and when Carla first heard the score she liked it and the rest of them got in behind her. “They were musical actors, but not musicians, and she’s a musician so they all helped each other out as were all slightly out of the depth. They were great, a real privilege to work with. 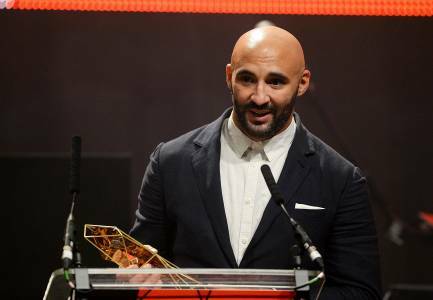 Also winning on the night was Londoner Yann Demange who won Best Director for ’71, focusing on the conflict in Northern Ireland and the life of a British soldier, played by Jack O’Connell who was also nominated for Best Actor. Unlike Calvary and Frank, ’71 does not count as an Irish co-production, as although about Belfast in the 1970s, it was shot largely in the north of England with no significant domestic investment. “The people of Northern Ireland have been so warm and receptive. It’s been great to tell their story as they traditionally never watch any films on The Troubles, but all the response has been great,” said Demange. Next articleThe Water Charges: Will They Sink the Irish Government?